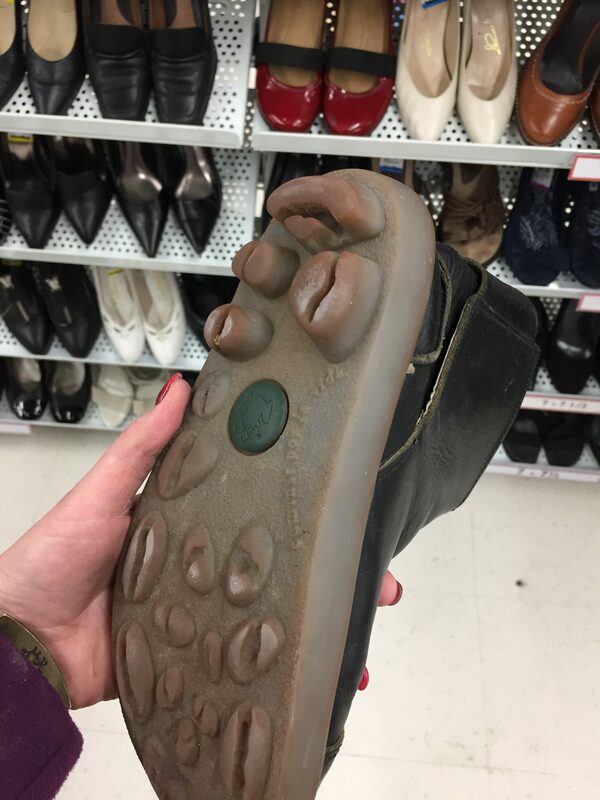 When the subject of thrift shopping comes up, people frequently tell me: I just don’t like shopping. And I get it. For shopping to be enjoyable, a number of factors need to collide in happy harmony – adequate time, adequate money, body peace, kids happily ensconced elsewhere in loving stimulating care (e.g., Aunty iPad), finding pieces you like that fit… Enjoyable shopping is almost a myth for the modern mother, and then when you throw thrift into the mix, many women simply can’t fathom it… UNLESS they have the help of a friend and thrift enthusiast such as myself! So it was the case for my friend Lisa last Friday night!! As I snapped this shot, I thought to myself, you should take two because your selfies are often blurry. Shoulda woulda coulda. Lisa and I met a few years ago at a scrapbooking retreat and I was struck then by her easy friendliness. Lisa is down-to-earth, approachable, interesting and interested. She is the stay-at-home part-time-working mom of four great kids with her youngest in kindergarten. Maybe other mothers can relate to this stage of life when you’ve been in the blur of raising young kids for so long you kind of forget yourself. You’re so busy trying to keep all the balls in the air, you can barely fathom taking time to shop let alone relaxing enough to enjoy it. Anybody? Before you jump to the conclusion that Lisa is a harried mother, let me clarify; she is calm, cool and collected. She brought homemade peanut butter cookie dough cheesecake bars to the rink the other day! She is a patient advocate for her youngest with Down Syndrome, taking time to come alongside other mothers walking the same path. She is relatively new to this old community, yet has immersed herself and established meaningful friendships with many – and I count myself fortunate to be among them! 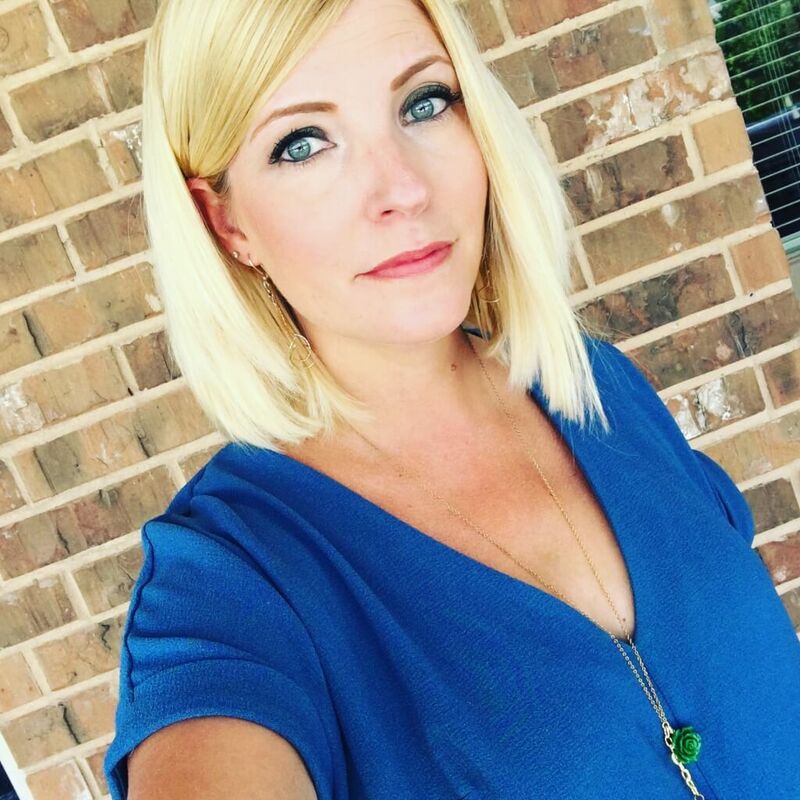 Lisa is one of those everyday extraordinary people and she wanted to use some of her Splurge money to thrift some “new” pieces and add some life to her existing wardrobe! The only problems were that she doesn’t like shopping and doesn’t know how to thrift! 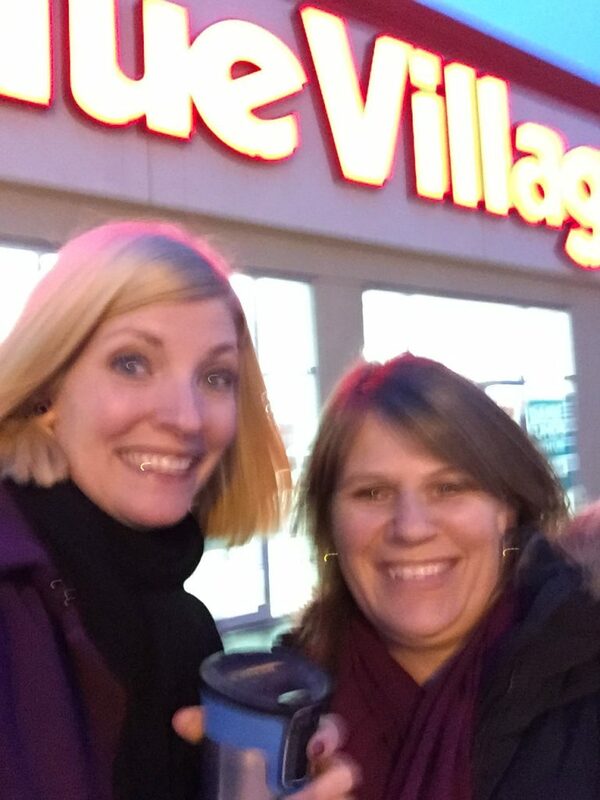 Enter Nicole (with “travel mugs” in hand along with some chocolate and candy, because that makes everything better!)! 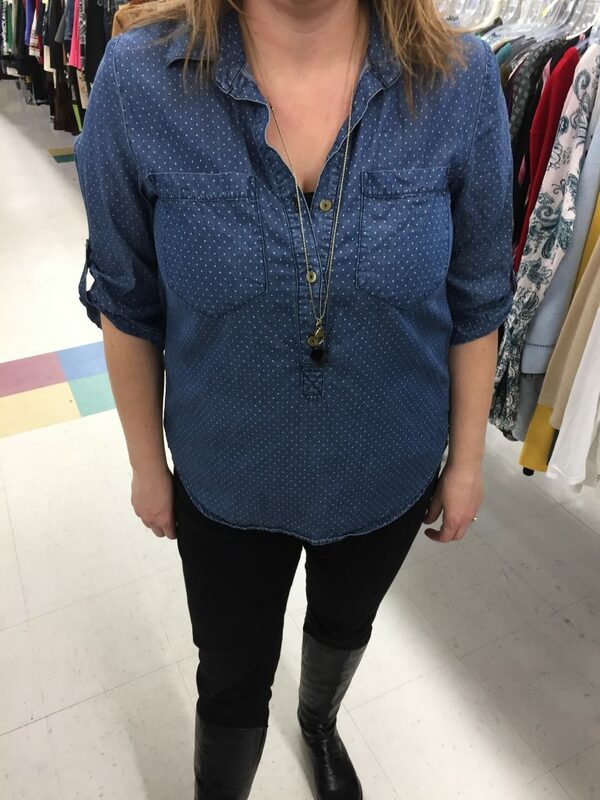 We hit up the nearby VV Boutique with the goal of finding some jeans, boots and maybe a few tops. Lisa, like many of us, wanted to upgrade her mom style – ditch the yoga pants and hoodies and replace them with more stylish options. 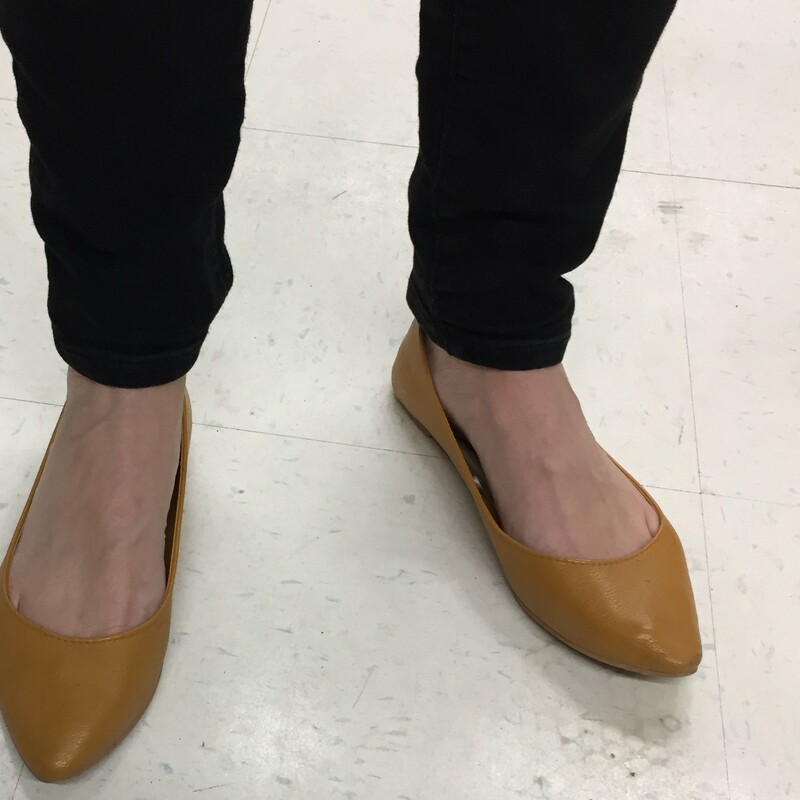 As per my usual thrifting practice, we hit the shoes first so that Lisa could wear any potential pairs while shopping to determine fit and comfort! 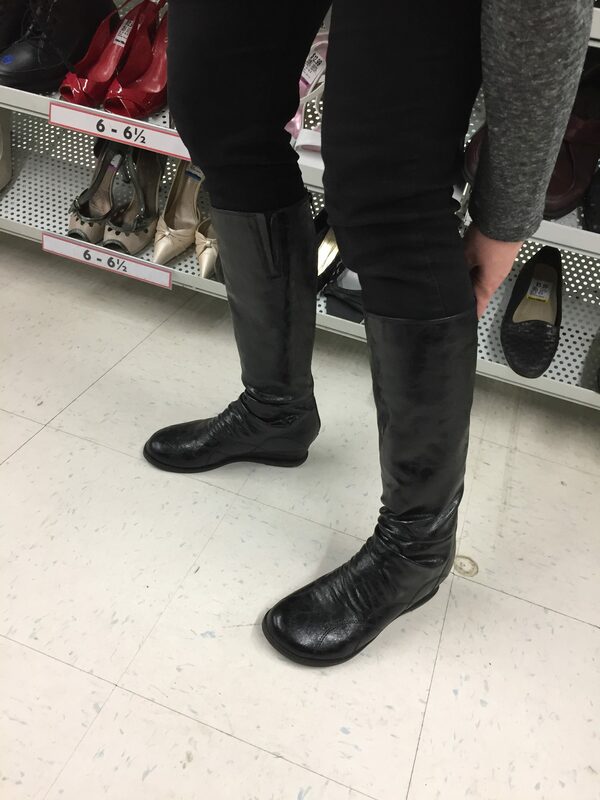 I loved these Blondo boots and they had a great grip, but Lisa thought they might be too fancy for everyday use and might not afford her the mobility required to quickly chase after kids! I can understand the second concern but as for the first, a key strategy to upgrading your mom style is to JUST GO FOR IT. Wear your “fancy” pieces!! Don’t save special pieces for special days – make an ordinary day special by wearing them! 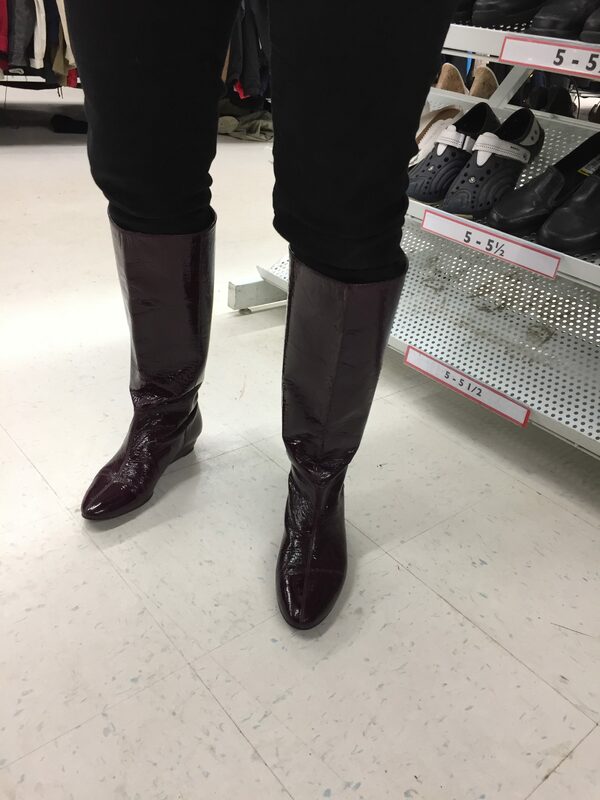 I also loved these BCBG Girls patent burgundy boots but they didn’t quite fit right and were a bit too shiny for Lisa’s taste. 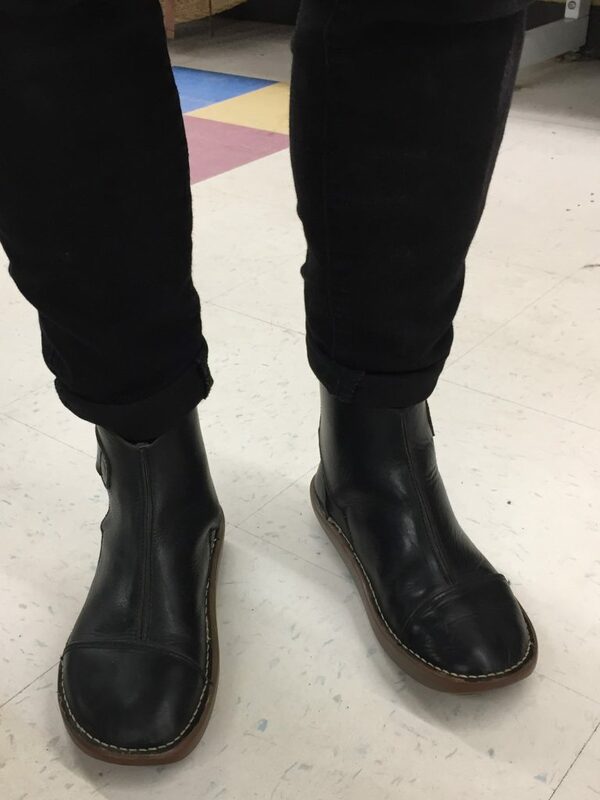 Then Lisa found these Miz Mooz boots!! My fave shoe brand!! 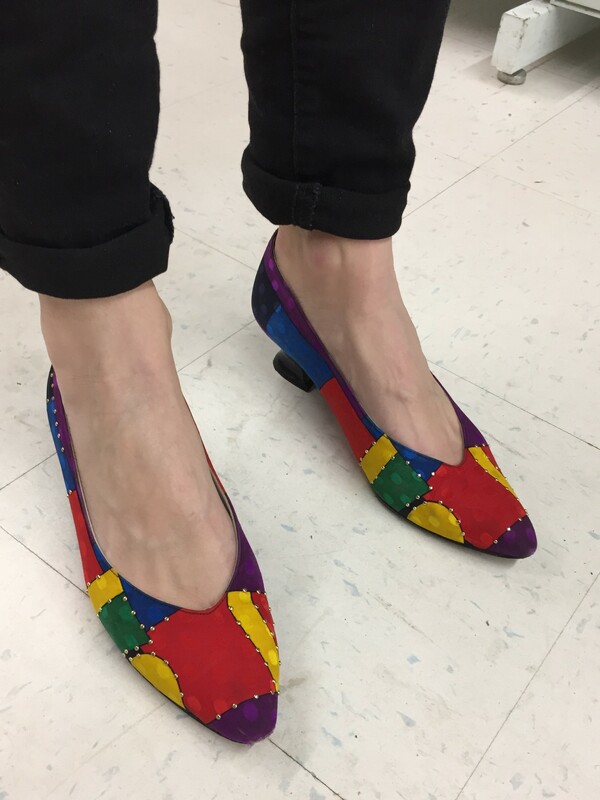 The zipper is a bit sticky on the heel but otherwise they fit her narrow calf well and will definitely see $16 worth of wear!! Great score! Lisa scored these suede Dr. Scholls boots. These are like cozy portable foot pillows that will be perfect for the rink – with 2 boys in hockey, Lisa spends plenty of time there. 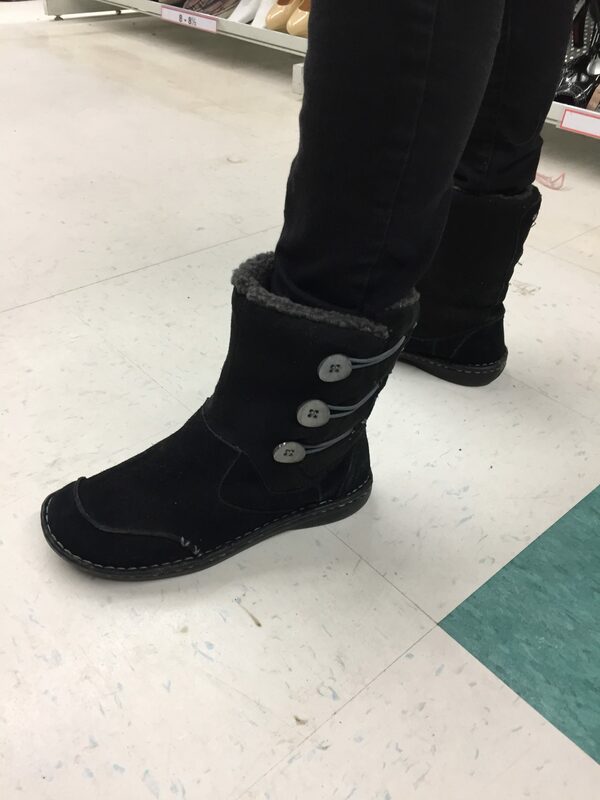 The button detailing makes them more stylish than boring black boots. B.O.C. black flats for $6! These are around $80 regular retail unless you’re lucky enough to get a sale. 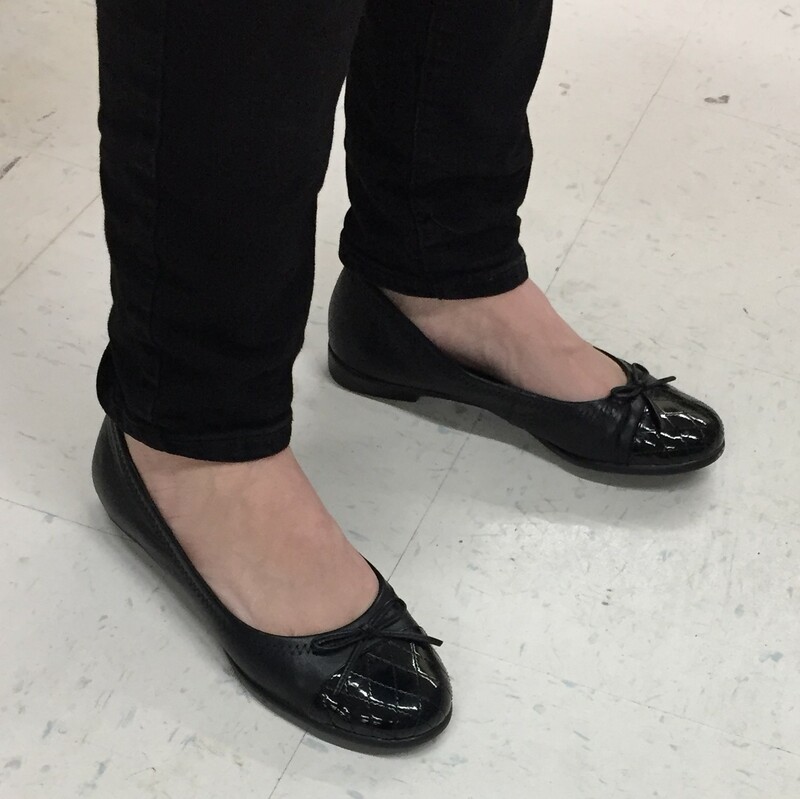 Comfy black ballet flats replace running shoes for school drop-offs! Lisa tried on a bunch more pairs of shoes but didn’t take any others home. She has a slight discrepancy in foot size so has to be selective… But these are all contenders for upgraded mom-style! And though comfortable on, they looked pretty meh. Then I made Lisa try on these vintage (I think!) Stuart Weitzman’s because they were too small for me! Boo hoo! Lucky for Lisa they were too big for her or I would have made her take them home so I could live vicariously through her! The bottom (!) 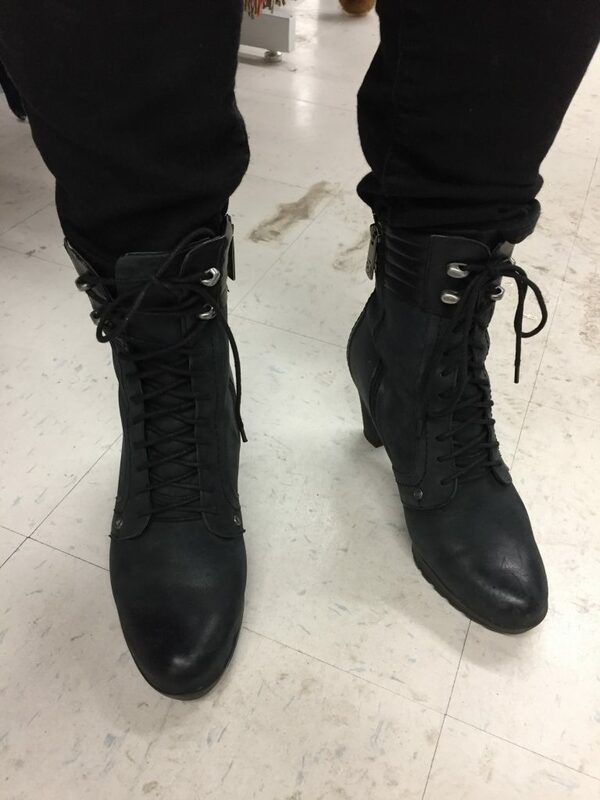 line with footwear is that interesting shoes and boots can add pizzazz to an otherwise plain outfit. No need to be matchy-matchy, no need to stick to neutrals. In fact, a simple styling trick is to put on a pair of “statement shoes” with a plain outfit for instant chic! Any of the shoes above would look great with jeans and a tee. 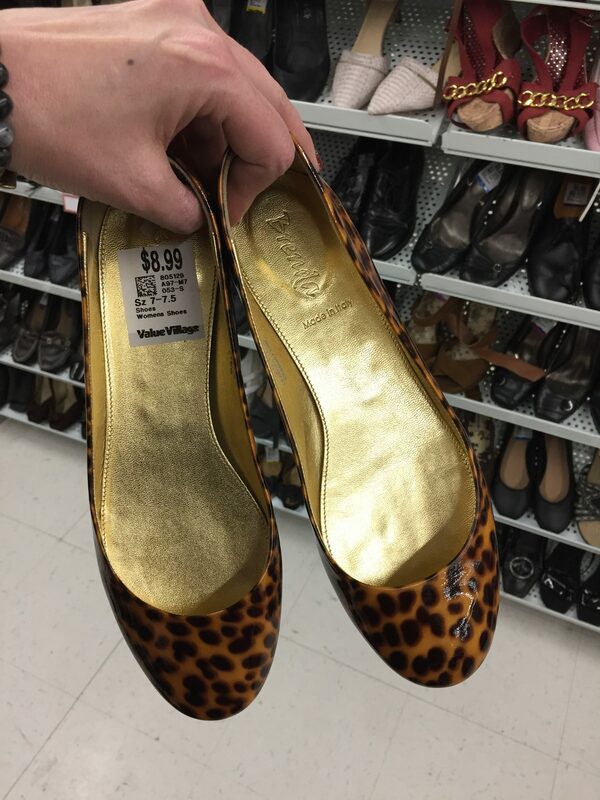 Just wait, Lisa, now that you know the great shoes and great deals that can be thrifted, you’ll start collecting! It happens to the best of us!! This jacket was a nice alternative to a hoodie but it had no closure and the $15 price tag was steep, relatively speaking. Pass. 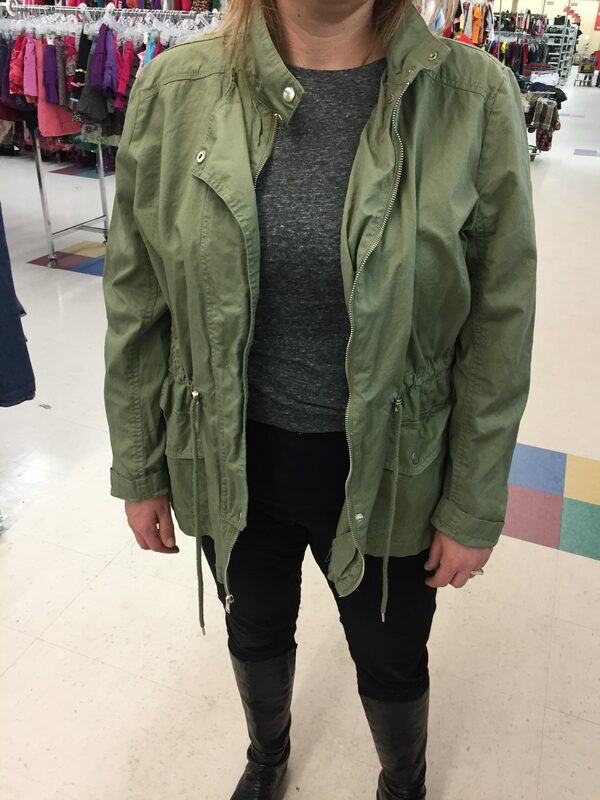 This olive coat was sooooo close but just too big – however, now we know what to keep an eye out on the next thrift trip! There *will* be a next, right?!! 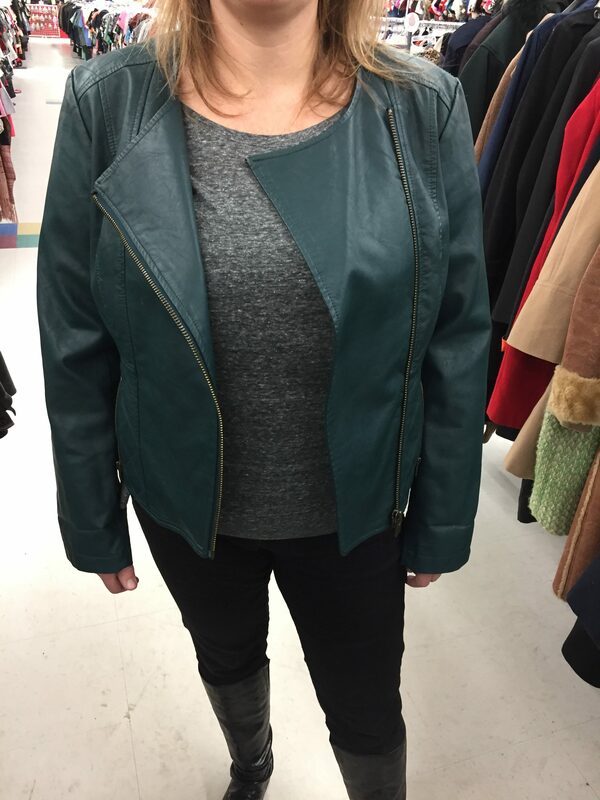 Lisa indulged me projecting Nicole’s style onto her via this teal leather moto jacket! 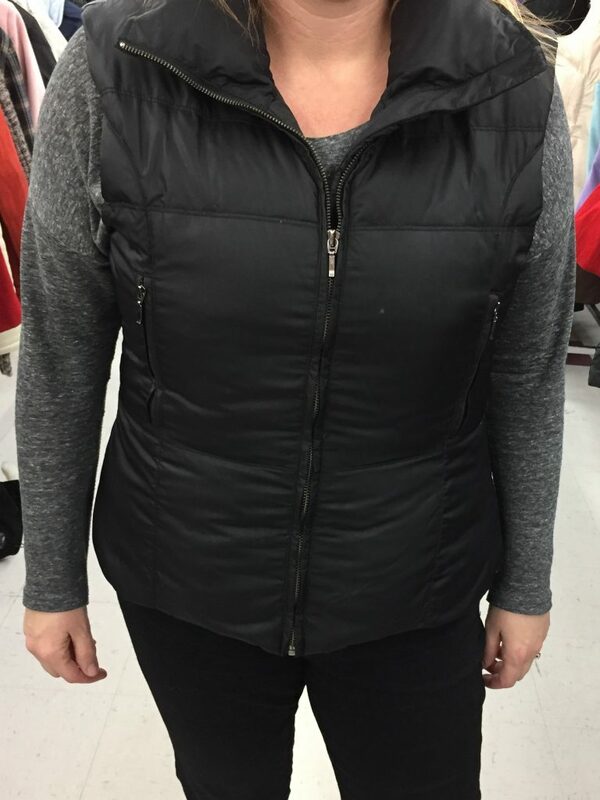 This is more Lisa’s vibe – a down-filled puffer vest in classic black, perfect condition, for FIVE DOLLARS!!! I heart thrifting so much!!! Now, I neglected to take a photo of our cart which turned out to be a mountain of pants on wheels!! Lisa probably tried on 40 pairs of pants (!) and ended up with 4 pairs of jeans – one dark wash, one lighter wash, one black and one burgundy. 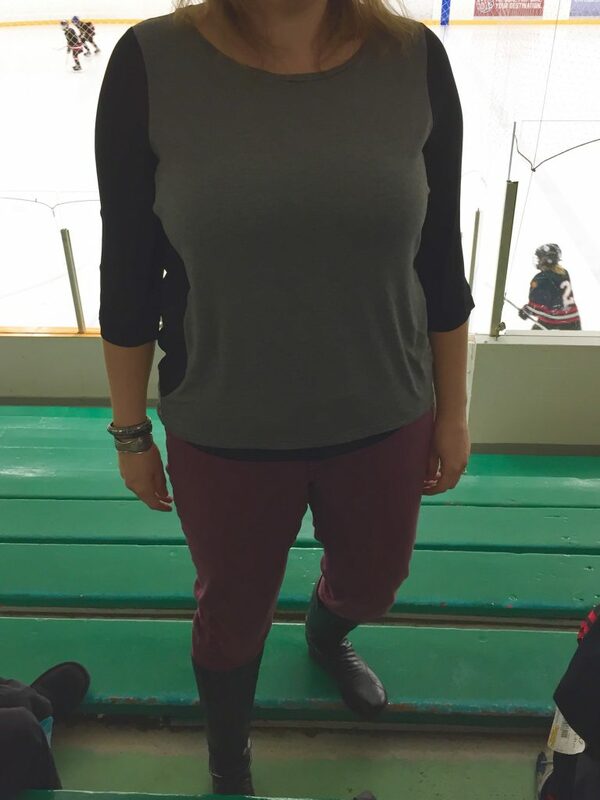 She wore the burgundy ones today to hockey and looked AWESOME! 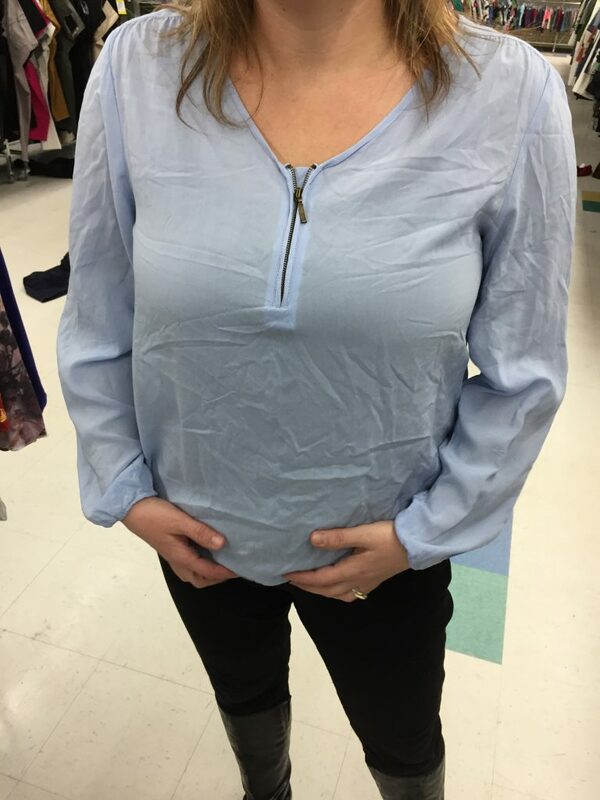 Lisa wore a tank top so she could quickly slip on tops as we scanned the racks, and she found seven tops including the one above! Polka dot popover chambray! Wear a short necklace, a long necklace, a scarf – it will go with EVERYTHING. I kept finding popover style tops and they all looked fab on Lisa! We narrowed it down to the chambray and this classic olive one – olive looks ah-mazing on Lisa with her hazel-y-green-y eyes and it is a true neutral, meaning it can be worn with everything. Prints, solids, other neutrals will all work! My personal faves for mixing with olive include navy, cobalt, salmon, coral, burgundy and red. And black of course! 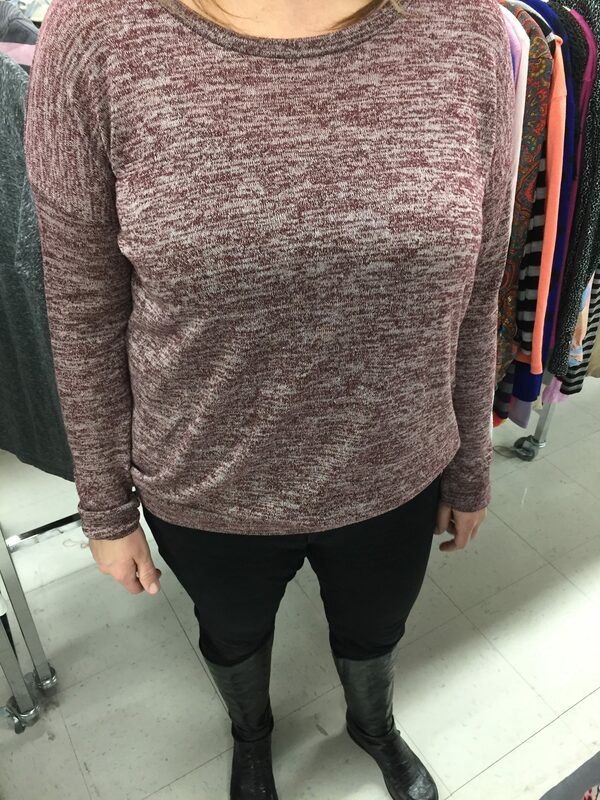 Burgundy is another one of those neutrals that looks great with anything – though we determined this top is a little TOO matchy-matchy with her burgundy pants! This pretty blue Soya Concept top was slightly outside Lisa’s colour comfort zone but looked great on her! swap out yoga pants for skinny denim – stretchy and comfy but meant to be worn on the street! swap out runners for boots, interesting flats or statement shoes – not sure what to wear with different pants or how to style ankle boots? A quick Pinterest search will tell you everything you need to know! accessorize – put on a scarf or necklace or bracelet or all three preferably! 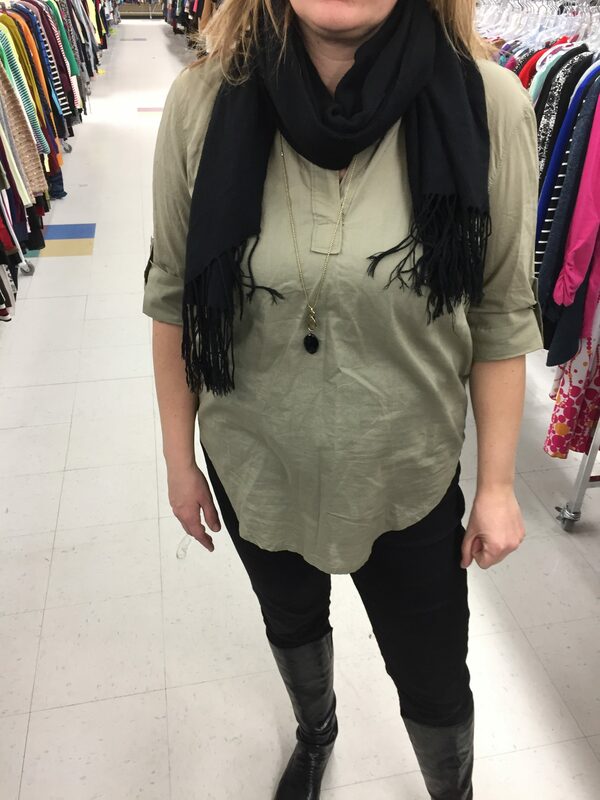 We didn’t have time to shop for scarves but there are so many options at the thrift store and the cost ranges from about $3 – $8 for something you’re bound to wear many times. It’s an easy and inexpensive way to extend the versatility of your wardrobe. You can’t have too many scarves!! go forth with attitude!! Maybe it’s not what you normally wear but a confident attitude makes any piece work! I love that every piece Lisa got can be mixed and matched with each other. She ended up with 15 pieces at an average cost per piece of $9.09! Sadly, we did not have a 30% off coupon otherwise she would have saved herself nearly $40! That’s good motivation to take in your donations before you shop! Later that night, Lisa texted me to share that her daughter took one look at her bags and wanted to go thrift shopping too! 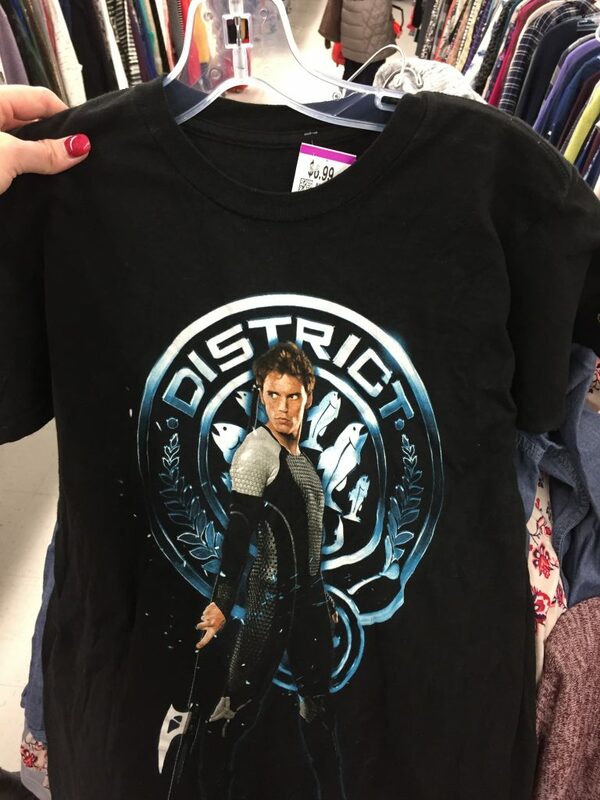 I think we have a thrifting convert, ladies and gentleman, which makes me so happy! I would love to go again with Lisa, but even on her own, she can take an hour and twenty bucks and walk away with that perfect coat or four or five pieces for a new season! There’s virtually nothing to lose and great style to gain! Thank you Lisa for a wonderful evening – just text me when you’re ready to go thrifting again! Good for you and Lisa. I love your tips but found our vv was really overpriced last time I was there. Maybe I should give them another try. 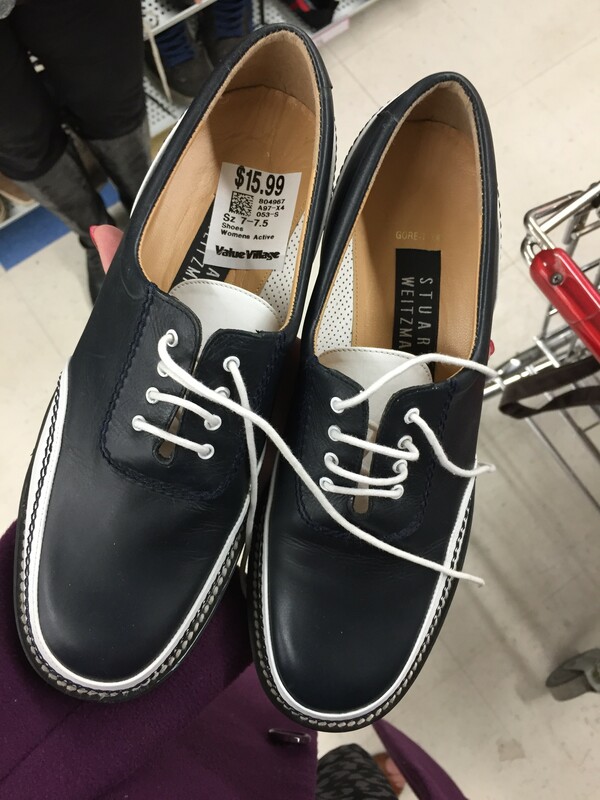 There is definitely overpriced thrifting all over the place – VV, Goodwill, etc. 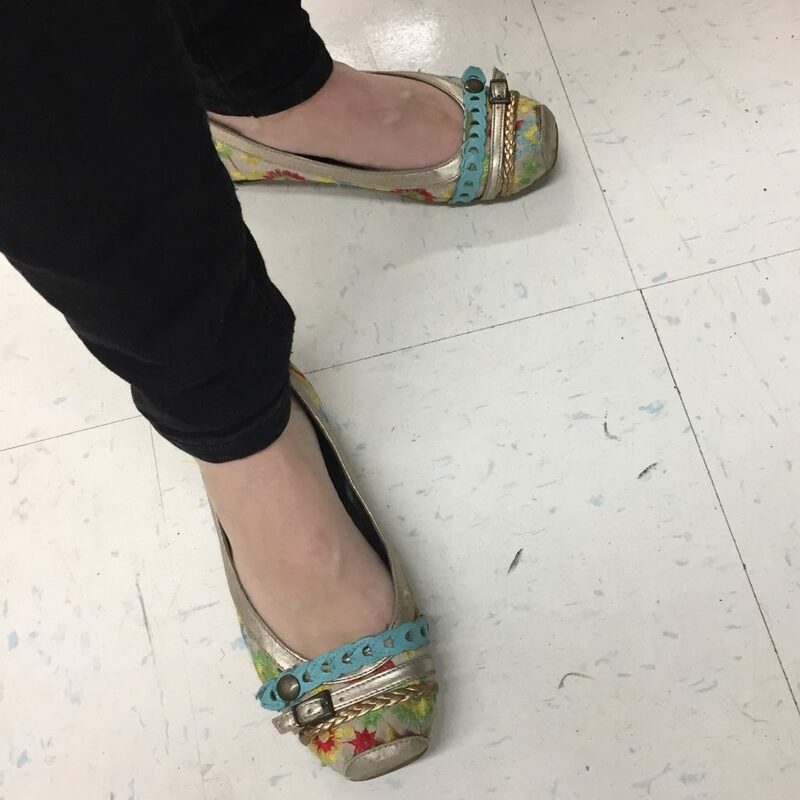 I think you just have to take into account the quality of the piece and how much you love it and if the price is too high, leave it behind – but don’t leave thrifting behind! 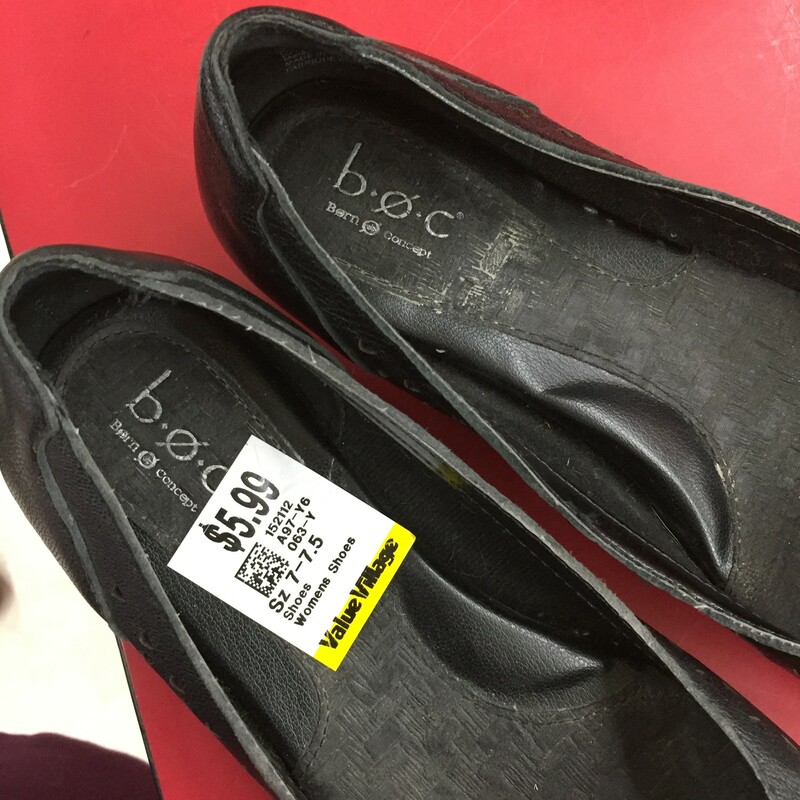 I still find great deals all the time and the bite out of the fast fashion industry through thrifting is most important. That sounds like a great trip. 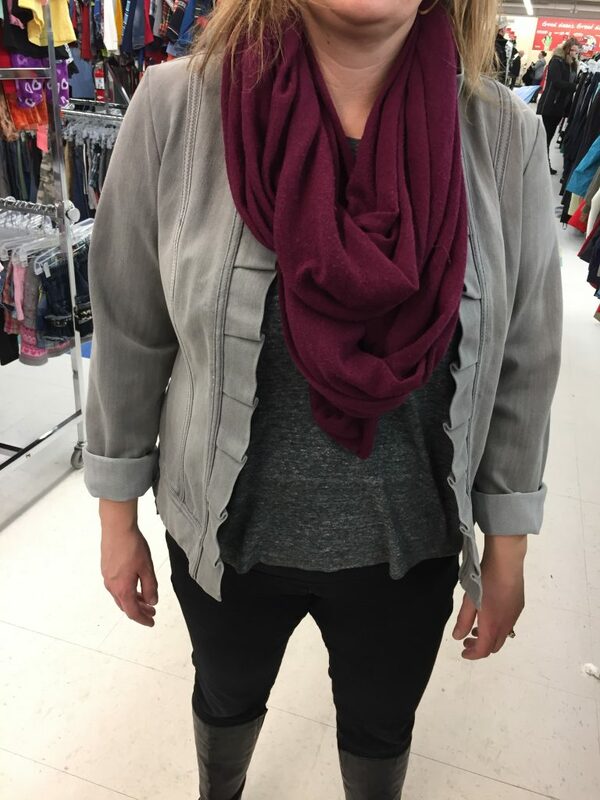 I had a major win at WINs YYC last week with 6 tops in plus size that are amazing style, and all under $9 each. Thanks for your inspiration.